Bring your garden to life!Perfect for pots, beds and borders. Exquisite and unusual, multi layered, frilly flowers in a dazzling array of fruity colours. Sweetly fragrant and bursting with colour! Long flowering and totally winter hardy! Supplied as a pack of 20 mixed colour jumbo plug plants, large enough to plant straight out in Autumn. 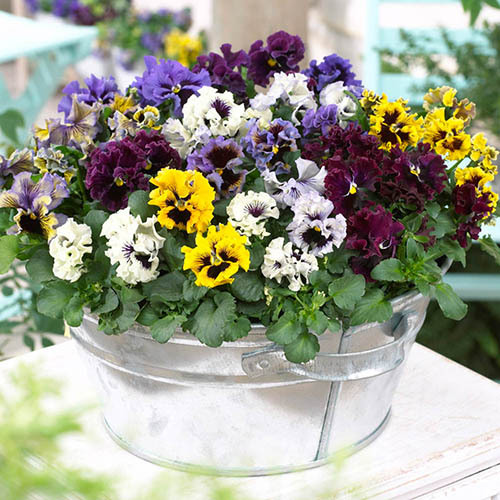 This incredible Pansy Frizzle Sizzle mix is an exquisite and unuusal mixture of multi-layered frilly flowers, many of which have delicate 'cats whisker' markings. Something really different for Winter colour and interest. A dazzling array of fruity colours to brighten up your borders and patios, they will fill your garden with sweet fragrance; they are long flowering, very hardy and perfect for patio containers and flower beds or borders (plant 15cm apart). Pansy 'Frizzle Sizzle' are compact and will grow to about 15cm (6), and perform best in full sun or light shade.